This pattern is created by myself, as I adapt spiral technic base on its structure using the holding cord connect every things together. There are 1 holding cord on each stone. Arrange 2 tone in you preferred position. In my design I use holding cord on left stone to connect with working cord on right stone. But also would like to make a space between 2 stone. So I put 3 beads to make a space first. 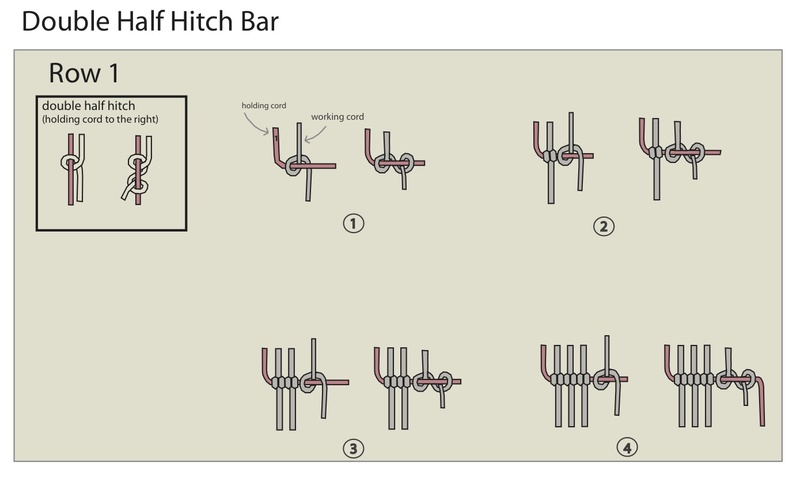 Then knot a spiral wrapping (Double half hitch or horizontal half hitch bar) around right stone. Two stone are now connected at the bottom part. Next, we will connect the upper part. I use 1 cord from left stone to be a holding cord, the rest of cord will be working cord. Ty the double half hitch, from left to right. In my design, I will add 1 handmade pendant at the bottom of right stone. So I put it in the holding cord. Then I continuing knot the double haft hitch. You can make many spiral wrapping to make a thick work as you want by doing the same method. In the picture I use 1 cord to be a holding cord again for securing my handmade pendant. When connecting is finish, I separate the rest of cords. 2 parts(blue color) will be necklace line for left and right. The rest (green color) will be cut and burn. Amazing...I love your work and how you fotograf it for tutorial.